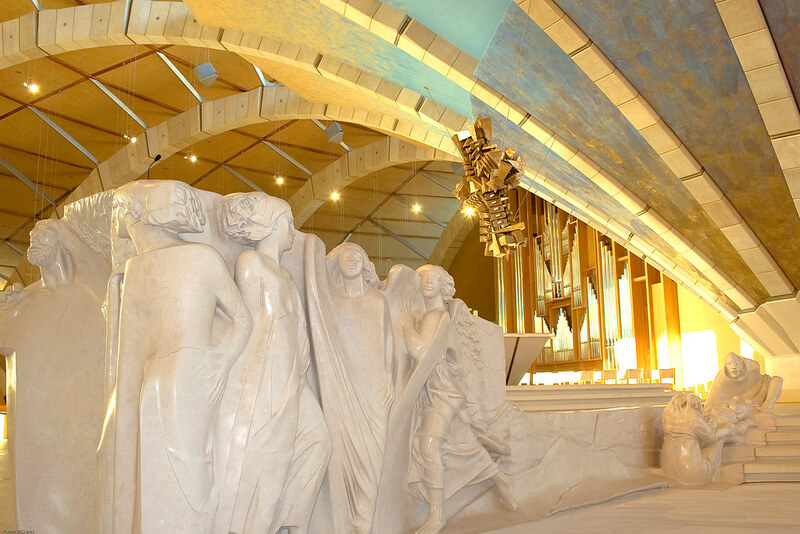 The monumental ambo of San Giovanni in Rotondo, the sanctuary newly built for pilgrims to the shrine of Padre Pio in Italy, is pictured below. It is of sculpted marble. Its narration begins on the right and moves toward the left and on around three sides of the central balcony from which the scriptures are proclaimed. Beginning on the right is the deposition of Christ’s body. As the narrative moves toward the left the angel rolls away the stone and then an angel announces to Mary. Two figures of Mary form one corner of the ambo: one figure of Mary faces toward the angel and another image of Mary faces toward teh risen Christ on the front side of the ambo. Perhaps this narrative technique could be rendered in bronze! These sculptures enclose a platform from which the good news is proclaimed, not only the Gospel reading but also the other readings from scripture. Proclaiming all scripture from the midst of this sculptural narration of the resurrecturion means that all scripture is interpreted in light of the good news of the resurrection.